(Left) Mr. P. I. Joy of Joy TV; Dr. Jay Sampat, a recent recipient of Indo-American Press Club's Humanitarian Award; Mr. Joe Profit, who was a political candidate​; and SAI Health Fair organizer Dr. Sujatha Reddy. 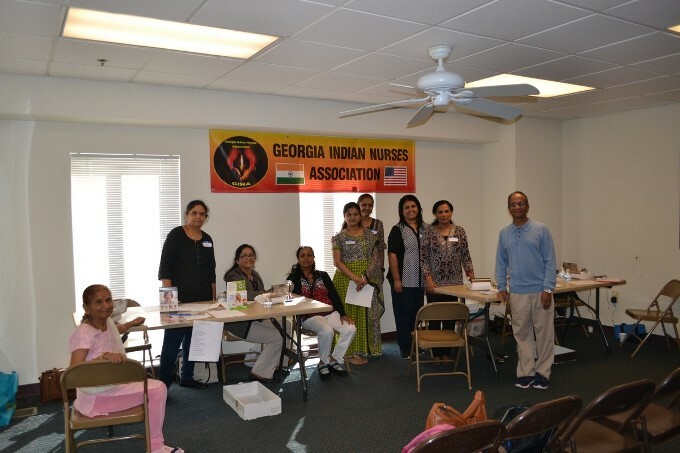 SAI Health Fair in coordination with Georgia Indian Nurses Association (GINA) hosted the 40th SAI Health Fair at the Hindu Temple of Atlanta, Riverdale, Georgia, on Saturday, October 13, 2018. 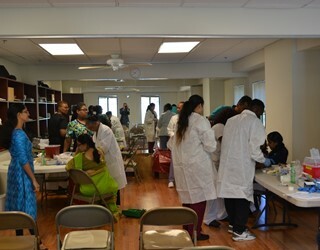 The Health Fair was organized by Dr. Sujatha Reddy as a tribute to the life and legacy of Mahatma Gandhi and also to promote his philosophy of nonviolence, community service, and social justice. It was sponsored by Sangisetty Charitable Organization and also strongly supported by health care professionals, nurses, and doctors. From early morning, people attended the Health Fair for blood tests and also availed themselves of the free consultancy in 11 specialties by over 20 committed, dedicated, and widely respected experienced physicians, supported by seven nurses, technicians, and courteous service-oriented volunteers. Over 110 cost-effective, basic quality comprehensive chemistry blood tests with HbA1c were carried out at a nominal fee of $30 per test. The lab work was provided by American Clinical Labs. It is noteworthy that the results of the blood work were mailed within ten days with instructions to be followed at the free clinics as mentioned in the cover letter. The test results helped identify some life threatening results which were immediately notified to the participants. Over 50 EKGs were carried out by Emory Southern Heart Specialists. Over 15 audio screenings were done by Dr. Sridhar Krishnamurthy of Auburn University, Alabama. Peripheral Bone Mineral Density screening tests were in big demand. 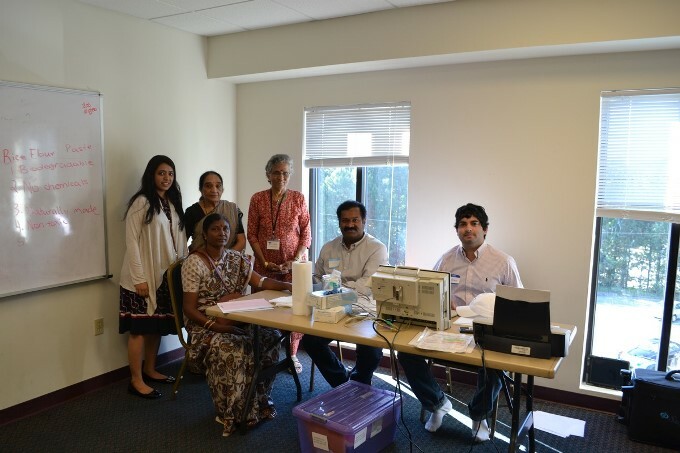 More than 35 bone density tests were performed by a team of Madhu Reddy, Kishan Bhagwandas, Vasantha Bhandari, and student volunteer Spoorthi Nuthakki, under supervision of Dr. Sujatha Reddy. About 50% were abnormal. These bone density tests helped the participants become aware of osteopenia and osteoporosis. Susan G. Komen Atlanta organizations' Pam Garner gave out very useful informational material and advice on breast cancer awareness and mammograms, while advice on diabetes, high blood pressure, smoking, Exercise, and nutrition was given by Raquel Merced. Dr. Sequioa Du Casse and Novelette Ducasse of US Neuropathy gave advice on specialized treatments for nerve pain caused by diabetes, prediabetes, physical injury, foot drop, etc. Podiatry: Dr. Sequioa Du Casse, who all interacted with patients through free consultations. Dr. Jay Sampat, a recent recipient of Indo-American Press Club's Humanitarian Award; President of Think Development Systems, Inc. and CEO of Joy TV, Mr. P. I. Joy; and Mr. Joe Profit, a former American football running back with the Atlanta Falcons in the NFL, who was running as a Republican for Congress in Georgia's 4th Congressional District, all paid a visit to the Health Fair. Mr. Joy informed the attendees of a free Community Health Fair at the Church by the side of Cherians International Groceries on 751 DeKalb Industrial Way, Bldg. #4 Decatur, GA 30033. Snacks, fruits, and drinks were provided to all the participants by Crescent Pines Hospital, Stockbridge. 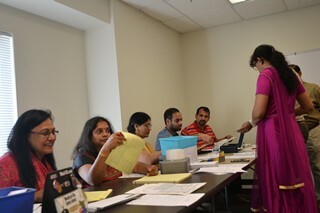 Sai Health Fair provided for lunch to all the doctors, nurses, technicians, and volunteers. Publicity coverage was carried by Khabar magazine, NRI Pulse, Telugu Patrika, Wownow, Rashtradarpan, Desi Express, and Atlanta Dunia.